They tried to start on Alien as it was the script that was going somewhere, which meant putting aside Total Recall. And Ron did his best to help Dan get further with it, but before they could dig deep into the project, they became sidetracked when suddenly Dan received a phonecall from Alejandro Jodorowsky, a Chilean director and this was somewhere in the summer of 1975. In Dan's memory, he wondered briefly if that was Paris, France or Paris, Texas, but no, it was really Paris, France. By then Alexandro had made a movie called El Topo which was very well received, and this man over a transatlantic phoneline claimed that he had the backing and the rights to make a feature film of Dune which was to be an adaption of the novel by Frank Herbert by that name and he loved Dan's special effects that he did for Dark Star, and he knew that he had to do it as a budget with some creative people, so he hired Dan to work on it, to help him with the storyline and manage all of the special effects in general. When Jodorowsky came into town, he phone Dan, who later went up to his hotel room, and there he was, and Dan was completely shocked. Dan remembered how in In El Topo, he had had this big beard and long hair down to his shoulders, and he was a raving lunatic. In the book version of the film, the interview, there were pictures of him looking like a woman, and it was bizarre for Dan. But when the hotel room door opens, he was greeted by this charming, continental gentleman: clean shaven, styled steet-grey hair, wearing a cream coloured suit. The door opened and this elegant man stands there, and he gives me the most ingratiating smile and said "Hello", and bows Dan into a room. He was completely disorientated, enchanted and by the end of the day he would be a total fan. As they sat in the room, Jodorowsky interviewing Dan, a knock came on the door and David Carradine walked in and so Dan got to meet him as well. From his suitcase, Jodorowsky produced a little piece of folded-up Oriental newspaper and said "This is holy marijuana. This is for spiritual purposes. " And Dan responded "Oh boy." So they all smoked it and it was incredibly strong. The three of them spent this very wild afternoon. While they were sitting around stoned, there was a remarkable moment in which Jodorowsky begins to talk. Carradine is crawling around under coffee tables doing Tai Chi positions, and Jodorowsky has taken off his suit jacket and is running his fingers through his hair... which is now sticking out in all directions. With this Dan felt more comfortable when Jodorowsky began to get a little wild, because Dan was a little bit of a strange person. Jodorowsky started talking, in a way that suggest that he was in top form that day, Dan was mesmerized in the manner that perhaps one might be from listening to the likes of Orson Welles speak, Jodorowsky had this ability and he began to talk about the destiny of Man in the galaxy, because it was related to the concept of the picture which they were all discussing. Dan recognised that Jodorowsky was a mystic, and that he talked about a lot of things that were intriguing, but not very familiar to Dan and as a result, he couldn't really remember clearly what was being said. He was talking to David and Dan, relating to them personally at the same time, so that he was an incredible show. It would be one of Dan's most spellbinding things that he ever did to listen to Jodorowsky talk. Jodorowsky spoke directly to Dan giving him some kind of instructions relaxing him in the chair and he only could remember that he was getting incredibly tranquil and they they were staring straight into each other's eyes for the longest time and Dan felt completely at ease, relaxed to such a degree that his conscious mind let got, he felt highly elevated when all of a sudden Jodorowsky says at the conclusion of a sentence , "LIKE THIS!" and he altered before Dan's eyes, seeming in one instant, all of his facial muscles relaxed and his eyes opened very wide, and at the the same moment, twenty years fell from his face. Dan could only describe that he had gone into a state of transcendental hallucination, he completely lost track of time and all of a sudden Jodorowsky says "LIKE THIS!" and out from his face shot these radiating lines of light, which produce around his head a shimmering, circular mandala or keleidoscope-like patten, with his face in the centre and his eyes locked onto Dan's, and the rest of the room vanishing into oblivion. Dan felt absolutely no sense of anxiety or discomfort at all. It was entirely stimulating and pleasant. And Dan was familiar with hallucinations set of by LSD but he was startled that this was being generated by someone's mind instead. 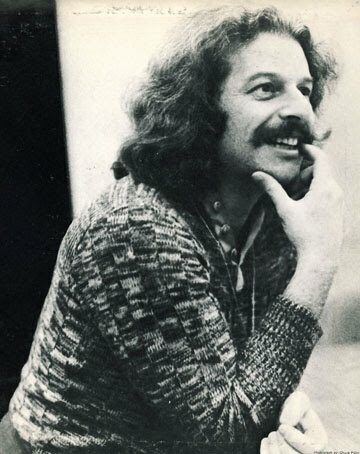 Then Jodorowsky relaxed all of his features; the eyes that had been staring at Dan like something supernatural all of a sudden relaxed, the lids came down, and the face smiled, and the twenty years suddenly came back to his face. Jodorowsky settled, and the hallucinative visual and mental effect dispersed immediately as if like a a BLIP!, like rags in the wind, and so Jodorowsky said to Dan "That's enlightenment. " A couple of days later Jodorowsky called Dan back and said "All right, I want you to be my director of special effects. Now sell everything you own and come to Paris and prepare to have you life changed. I come into your life like a hurricane." After Jodorowsky offered him this position, O'Bannon got a called from Gary Kurtz, the producer of American Graffiti who was now producing Star War and he was interested in Dam O'Bannon work on the special effects. Within a few weeks of the call from Jodorowsky, Dan took the plane to Paris, giving up his own car and his apartment, putting his belongings in storage and he went over there expecting to be there for several years. Dan was soon there in the company of Alejandro Jodorowsky, and he was very much a mystic and for a time one might say he was Dan's guru. But Dan was finding it quite a challenge in a foreign country and in a foreign language. When they were well under way, a lot of stuff was designed some months into pre-production. Jodorowsky shortly went to England and had plucked up a young artist who did book covers for scifi books, named Christopher Foss. For the first time, Dan saw someone's work that he liked as much as Ron Cobb's work. It was a time for major discoveries for Dan and he found himself then in contact with some remarkable fantasy artists, Jean ‘Moebius’ Giraud and Robert Venosa, all who were very big names back then, and he was also to discover their work since they were all working on the Dune project. At this time he was doing all he could to get Ron Cobb involved in the movie too. Venosa had taken Giger’s catalogue to show him, and asked Dali what he thought of it, Dali approved and then would show the catalogue to Alejandro Jodorowsky who intended to film Frank Herbert’s book Dune and was there trying to get Dali interested in it. Dali said to Jodorowsky showing him a painting "This is a fantastic artist, very good for you!" This unnamed catalogue would eventually be referred to by Giger as his "Necronomicon" although the book would not be published for a while longer. Robert Venosa told Giger how keen Jodorowsky was about his work too, and curiously enough Giger was expected to turn up to discuss the film's artistic elements. This seemed like a good reason for Giger to make a visit to Spain to meet Jodorowsky, who, by the time Giger had arrived there, had gone off elsewhere. However Dali showed a polite interest in his work and introduced him to his wife Gala, describing her as a specialist in monsters and nightmares, whose external appearance external appearance completely belied her inner world. Gala then expressed her opinion to Giger that he would only need to wear a mask in order to completely match the world of his pictures, and this led her into an hour long diatribe against the evils of the world, of which she had years of experience. She was one of the most impressive ladies that Giger had ever met in his life. Dali decided that Giger must be Austrian because he worked in a detailed style like the Viennese Fantastic artists such as Ernst Fuchs. When Giger was Dali's house, he was presented by Dali as an Austrian painter to the girls at his home, and Dali gave the girls any name he could find because there were so many people visiting him that he couldn't remember their names. The people would all come after 5pm when he was done working. There were all sorts of artists and good-looking people, all sorts of gangsters and he loved to be surrounded by musicians. 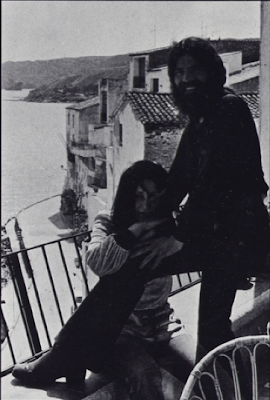 Giger then returned to Switzerland, stupidly leaving his current girlfriend in Cadaqués, where Dali used her as a model, he tried to seduce her and even tried to couple her with a young hippie. 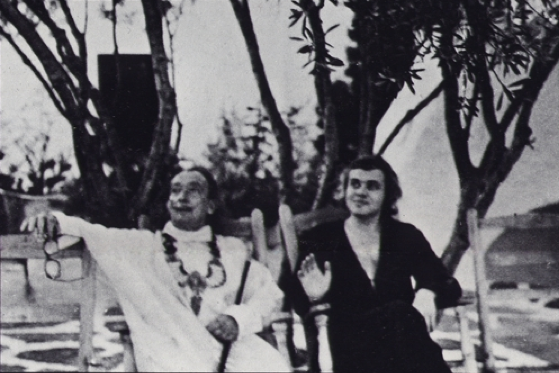 Dali wanted to celebrate the ceremony himself and supervise the accompanying rituals, in his own special way. Giger however was secretly amused by the whole affair, as he had just read John Fowles' "The Magus" and quite understood what Dali was up to as if he were behaving like the character Mauric Conchis from the novel. Because his people always tried to treat him like a king or a priest, they did what he wanted. It appeared that according to one version of Dan O'Bannon's story, Alejandro Jodorowsky had discovered something in the Bibliotech National, a document that was someone's PhD thesis which was a study of the actual Necronomicon that was peceived to be an imaginary book that HP Lovecraft imagined and wrote about, and that book among other things, contained an account of the Old Ones, their history, and the means for summoning. The student who wrote the thesis had since disappeared. Alejandro must have known that Dan O'Bannon was a great fan of Lovecraft, but this thesis was a study of the Necronomicon, quoting many individuals but it was primarily written as a long essay quoting substantial chunks of the Necronomicon from different translations, in Latin, Greek and English and this was the nearest that Dan had got to the real thing. When Jodorowsky first asked Giger to work on Dune, he took Giger to a concert by the Paris based band Magma, it started two hours late. Giger was fascinated by their music to the point of being very fulfilled, he had never heard anything so loud, and afterwards he told them "I felt just like Christ when he was on the cross." This would eventually lead to Giger creating an album cover for their album Attahk in 1978. Jodorowsky went to an exhibition of paintings at an art museum in Paris, Giger had designed the poster for an exhibition at the Galerie Bijan Aalam, (22, passage Vero-Dodat, Paris) titled "Le Diable" which was of course about the devil, it began December 5th 1975 and would close the 10th of January 1976. Jodorowsky was very enthusiastic and so he said to O’Bannon one Sunday, "come with me. I have a new artist to meet”. At the exhibition, Giger was exhibiting the Necronom paintings that would eventually become the Alien. Since O’Bannon considered Jodorowsky to be like a guru to him, he would go anywhere that Jodorowsky wanted him to go and he was showing Dan the world at that time. Giger stayed in a hotel in Paris and so they went to see him at the suite where he was staying, Giger remembers that he met them at the Atelier One, it was the the hotel suite where Jodorowsky was staying. So they went inside, and there met Hans Rudi Giger who was about Dan’s age, who looked to Dan more or less like Dracula. He was entirely dressed in costume black leather clothing, his hair was black, and he had very pale skin as if he had been avoiding the sun, and Dan likened the expression on his face to being intense maybe like Edgar Allen Poe. Giger came up to Dan holding some tin foil and said to him, "would you like some opium?" When they went inside, Jodorowsky talked with Giger about the Dune project, spending an afternoon, trying to decide if he wanted to get Giger involved in it and then going ahead to contract with Giger to do some designs. As they were talking, O’Bannon was looking at a book full of Giger’s pictures that had been printed up to accompany the exhibition of his work in Paris, it was actually Giger's book "Arh+" that printed back in 1971. O’Bannon found it to be very powerful and then asked to borrow the book, Giger said yes, and Dan took it back to his own hotel room that night and he spent the night carefully looking through the works in the books. He realised that he had been struck by an experience of a particular artistic depths and originality that he had never seen before, it was indeed a moment of transformation for Dan. The paintings were disturbing but in the context of great beauty, so O’Bannon told himself “ If you could get this guy to design a monster movie, you would have something absolutely original and unique." and he remained very much haunted by his work when he got back to America. Dan imagined that if he wanted to, Giger could paint Pickman's model from HP Lovecraft's story if he wanted to. In that story "Pickman's Model", the artist Pickman painted a horrifying monster a horrifying humanoid animal like thing as life like as a photograph. The way it was working out with Dan’s mind, since he wanted all the people that he could from the creative team from Dune to get involved in his his space monster movie, this would have meant that it would have an extraordinary look for it possibly as strange as Jodorowsky’s Dune. 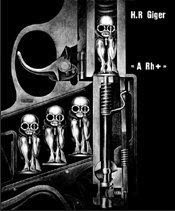 cover of HR Gger's book "A Rh+"
When they got around to talking about money, Jodorowsky said to Giger " You may be a genius, but we can't pay you as a genius"
Giger asked about what the other contributors were getting and Jodorowsky replied "Foss gets 4000 Francs a month"
And so Giger thought, this was a modest salary indeed for a creative designer of a project costing twenty million. Jodorowsky went on to explain to him at length about what good publicity it would be for him. As they parted they agreed that Jodorowsky would telephone Giger about the salary, and gave him the script so that he could start work right away. As soon as Giger returned home, he received a call from one of Jodorowsky's assistants saying that he should produce a view of the castle on the planet which they had spoken about, 55x65cm and bring it to Paris where they could look at it and see it was suitable for the film. At this time, Jodorowsky wasn't thinking of the work of others, but only his own work, the fact that he wanted to describe different planets, and with each planet an aesthetic, with tables, chairs, all things that are in a palace. He needed to have this discourse with the psychology of the characters. Baron Hakonnen who ruled Giedi Prime was the darkest character of Dune, and because of his psychology, his was the dark world. 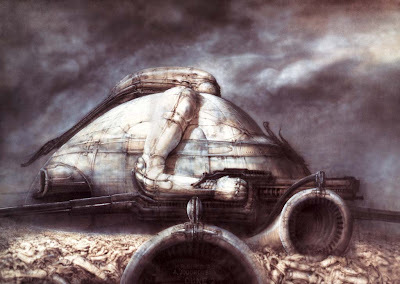 Giger was needed to illustrate the planet, the palace, the objects and everything on this planet. including the planet, the palace, the objects. So it was that Giger had a world that Jodorowsky would call shadow and he liked that Giger illustrated one part of that. That was his thing, something Jodorowsky would call "the diablo". Some time later, Giger would return to see Dali at his museum. He asked Dali, if he would provide an introduction to his book Necronomicon. Dali said he would do it, but he asked for something from Giger in return. He wanted his sculpture Armour For A Dog, to which he agreed in 1976. He would visit Dali at the hotel Meurice in Paris to pick up the introduction. Giger wanted something large, if possible across two pages of the Necronomicon, so he gave Dali a large sheet of paper and he created the drawing with a felt tip pen. Interviewer: Now, you have an obvious interest in Lovecraft and arcane things and Lovecraft's circle people as well. Can you talk about your project the Necronomicon a little bit, what drove you to start to do that? HR Giger: Well now, i came across this project in a very mysterious way, back in 1975 I was in Paris working with Alexandro Jodorowsky, actually on a film then, and he was very much a mystic and you might say for a time he was my guru, and he discovered something in the Bibliotech National, a er, a document, and it was someone's PhD thesis and he brought it to my attention and I looked at it and it turned out to be a study of the Necronomicon, the real Necronomicon, the closest I had ever gotten to the actual original text, and I was so struck by this that I felt it needed to be brought to the attention of English speaking readers, so I spent the better part of ten years carefully translating this into English and I finally got it to a point where it's ready to be seen by the public at large. All that remains is a … to discover a way to market this so that people who want a copy can obtain it. Dan O'Bannon: It did not. It’s just sitting over on a corner of my desk, gathering dust. Over the years I’ve read a couple of Necronomicons published. I bought and read them and I was very disappointed, and I finally got annoyed. At the very least if you’re going to write a nNecronimicon, it should be scary…I just started compiling notes, and by the time it was done I realised I had a book. It’s not a long book, but it shouldn’t be long. It’s certainly dense. I don’t know if you’ve ever read Jekyll and Hyde…? Daily Grindhouse: Can you give us a feel for that project? Starburst: You were working on the preproduction of Dune in France. Why did the project collapse? Starburst: How far had the production got? Starburst: Well, they have all contributed to Alien now in some capacity. It's interesting to see some of Giger's paintings and Foss' Dune. Seconds: I read on one of your books that Dali tried to seduce your own girlfriend. Tom Gabriel Warrior: You later met Dali in person. Interviewer: How did you find his work? Dan O'Bannon: When he came into town, he called me, and I went up to his hotel room, and there he was, I was completely shocked. In El Topo, he had had this big beard and long hair down to his shoulders, and he was a raving lunatic. And in the book version of the film, the interview, there were pictures of him looking like a woman, and it was bizarre. But when the hotel room door opens, I'm greeted by this charming, Continental gentleman: clean shaven, styled steel-grey hair, wearing a cream coloured suit. I'll never forget this. The door opened and this elegant man stands there , and he gives me the most ingratiating smile and says "Hello", and bows me into a room. I was completely disorientated... and enchanted. Well by the end of the day I was a total fan. During the course of that one day.... it was quite a wild day; Jodorowsky's a high-energy person... I came to admire and completely trust him. And he did a remarkable thing that day. He... I'll drop a name... David Carradine. We were sitting in Jodorowsky's hotel room (O'Bannon lights up a hash pipe) Anybody want any. Dan O'Bannon: (inhaling) So he's interviewing me. Knock on the door, and David Carradine walks in. So I met David carradine. And Jodorowsky produces some grass. He goes to his suitcase and gets out this little piece of folded-up Oriental newspaper and says , "This is holy marijuana. This is for spiritual purposes. " And I said "Oh boy." So we all smoked, you know, and it was incredibly strong. So the three of us spent this very wild afternoon. And while we're sitting around stoned, there is a remarkable moment in which Jodorowsky begins to talk. Carradine is crawling around under coffee tables doing Tai Chi positions, and Jodorowsky has taken off his suit jacket and is running his fingers through his hair... which is now sticking out in all directions. I felt more comfortable when Jodorowsky began to get a little wild, because I'm a little strange. And he starts talking, and he's really in top form that day. If you've ever seen a person like Orson Welles speak, you know what it's like to be mesmerized by watching somebody talk. And Jodorowsky has that ability. And he began to talk about the destiny of Man in the galaxy, because it was related to the concept of the picture which we were all discussing. Jodorowsky's a mystic, and so he talked about a lot of things that were intriguing, but not very familiar to me; as a result, I can't recreate a word of what he said. But I do remember his face... it was inspired. He's speaking, his hair's standing out, he's looking up through the ceiling with these wide eyes... he had incredibly huge eyes and this incredibly huge grin on his face like a person who's religiously inspired, and his hands are spread palms upward, and he is talking to these people, to us. And, of course, relating to us personally at the same time, so that he was an incredible show. Absolutely one of the most spellbinding things I've ever done was listen to him talk. And then he did a strange thing to me. And the damnable thing about it was, he led into it so casually that I took no mental record of what led up to it. All I remember is that I was very stoned, and he had me dazzled and interested and inspired. He was speaking directly to me, giving me some kind of instructions, relaxing me in the chair. All I can remember is that I was getting incredibly tranquil, and that we were staring straight into each other's eyes for the longest time. I felt completely at ease, he had me so relaxed that my conscious mind let go. I was feeling mighty elevated when all of a sudden, he says at the conclusion of a sentence, "LIKE THIS!" and he altered. In one instant, all of his facial muscles relaxed and his eyes opened very wide, and at the the same moment, twenty years fell from his face. I went into a state of transcendental hallucination, that's the only way that I can describe it. I've completely lost track of time... all of a sudden he says, "LIKE THIS!" and wham! out from his face shoot these radiating lines of light, which produce around his head a shimmering, circular mandala or keleidoscope-like patten, with his face in the centre and his eyes locked onto mine, and the rest of the room vanishing into oblivion.. I felt absolutely no sense of anxiety or discomfort at all. It was entirely stimulating and pleasant. And I was familiar... you know, this was not a.... this was startling to me only in the sense of having it generated by someone's mind instead of LSD. Then he relaxed all of his features; the eyes that had been staring at me like something supernatural all of a sudden relaxed, the lids came down, and the face smiled, and the twenty years suddenly came back to his face. And he settled, and the hallucinative visual and mental effect dispersed immediately. BLIP! like rags in the wind, and he said "That's enlightenment. " So a couple of days later, he called me back and said , "All right, I want you to be my director of special effects. Now sell everything you own and come to Paris and prepare to have you life changed. I come into your life like a hurricane." And so in two weeks I was in Paris. In two weeks, the complete transition had been made. It was overwhelming. And then for six months we worked on Dune. It was a dazzling experience, and Jodorowsky was impressive. It was progressively more clear what the picture was going to be like, because he was having every stage designed by many brilliant artists. He brought these artists from France and England and Switzerland, and I worked with them... and their was was... oh, I was so impressed. He put me in charge; I was the boss of thirty men. He had hired this company called Eurocitel, which is a special effects facility located in Paris and engaged them to do all the special effects for Dune under my supervision. He had me review their equipment to see if it was adequate and meet all the personnel that had selected to do these different tasks. I was very skeptical before I went over... but they had all the facilities and all the skills they needed, and I was impressed. PHOBOS: How did you and Jodorowsky get along? John Musker:And he got it didn't he? Moebius:He got it, I think we were working in Paris on that Project and Dino Le Laurentiis was running away in Hollywood saying "Never buy that project, it will ruin Hollywood, you know, those damned French people" So when Jodorowsky came to sell the project, prrrrrpppppppt, he had nothing and Dan O'Bannon, ahhhhhh, (mimicking vomit) (An evening with Moebius" by The Creative Talent Network® animation expo 2010. Giger: Oui, Magma également. La première fois que Alejandro Jodorowski m'a demandé de travailler sur Dune, on était à Paris et il m'a emmené à un concert de Magma. Ça a commencé avec deux heures de retard. J'étais fasciné car jamais je n'avais entendu quelque chose de si fort. Je n'aime pas la pochette que j'ai faite pour eux. Ils me donnaient trop de « conseils » (rires).